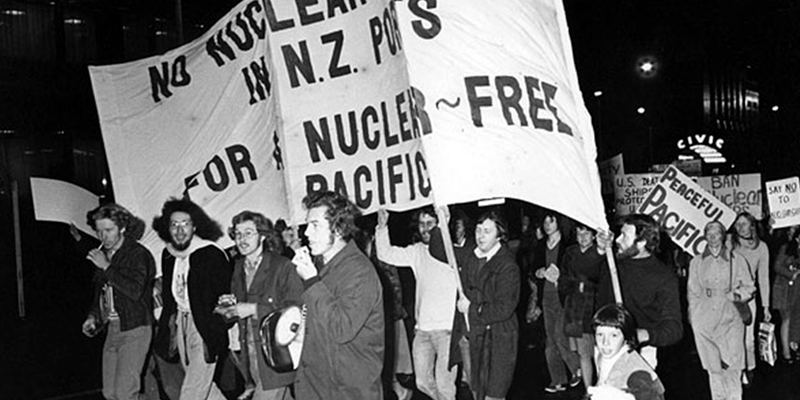 The Nuclear Free and Independent Pacific (NFIP) group grew out of the first regional Nuclear Free Pacific Conference in Fiji in 1975 which had been organised by the ‘Against French Testing in Moruroa’ (ATOM) group, founded in Fiji in 1970. Further conferences were held at Ponape in the Caroline Islands in 1978, in Hawaii in 1980 and in Vanuatu in 1983 where the far-reaching People’s Charter for a Nuclear Free and Independent Pacific was adopted. The NFIP movement brought together indigenous peoples from Hawaii, the Great Turtle Island (North America), Aotearoa, East Timor, West Papua, the Philippines, Polynesians, Kanaks, and others from South Korea and Japan. The Pacific Islands of Belau, Vanuatu and the Solomon Islands became nuclear free in 1979, 1982 and 1983 respectively. The South Pacific Nuclear Free Zone was adopted in 1985.